The Integration of Long-term Care, Home Care and Palliative Care in Taiwan Dr. Jui-Yuan Hsueh, Vice Minister of the Ministry of Health and Welfare of Republic of China (Taiwan). Background According to the WHO, the proportion of a society’s population that is comprised of persons aged 65 and above is called the “aging rate.” When this aging rate exceeds 7%, it is an “aging society;” if the rate surpasses 14%, it is an “aged society;” and if over20%, it is a “super-aged society.” In Taiwan, senior citizens above 65 years old exceeded the 14% threshold this year, which means Taiwan has officially become an aged society. Furthermore, it is anticipated to exceed 20% in the coming eight years to becoming a super-aged society. Since 2018, approximately 300,000 more citizens will reach age 65 every year. Among these elderly, 12% is expected to be disabled, which equates to 30,000 elderly, who will require long-term care services. This will be a huge challenge to the caregiver workforce and the caring system. It is predicted that in 2030, citizens above 65 years old will increase to 2.16 million while, at the same time, the number of workforce and newborns will decrease to 1.96 million and 0.37 million, respectively. The change of family structure and how these elderly will live deserve considerable attention, especially as data from the last decade indicate that the birth rate 1.13, and the average family members decreased from 3.5 to 2.7. Based on the Annual Report of Senior Citizen Condition Survey 2013—published by the Ministry of Welfare and Health R.O.C. (Taiwan) —more than 72.7% of the elderly live in flats or detached/terrace houses without elevators. Meanwhile, only 12.7% live in elevator-accessible buildings and the rest 14.6% of elderly live in single-story houses. Furthermore, elderly who live with children, grandchildren or parents has dropped from 29.8% in 2009 to 25.8% in 2013; and elderly who live alone has risen from 9.2% to 11.1%. Asked if they are willing to move in to longterm-care institution, it is clear that those elderly between 55 and 64 years old are more willing than those 65 and over. Apparently, economic independence and educational level are both important factors, especially as their economic resources depend mostly on their children and grandchildren, thus limiting their options. For the elderly above 65 years old who are disabled and require care services, there is a total of 737,000 people in 2017. Of these, 41% are being taken care of by family members, 32% by foreign caregivers, and 12% by institutional care. Only 15% receive community and home care service, which are supported by the governmentâ&#x20AC;&#x2122;s Long-term Care 2.0 policy. From the above evaluation, Vice Minister Hsueh has made the following conclusions: (1) there is a growing demand of care but insufficient workforce for it; (2) there are housing conditions that restrict the elderly from social participation and ease of seeking medical assistance; and (3) there is an increase of solitary living and economic dependence among the elderly. 2018 statistics, the current palliative services can serve 50,000 terminally ill patients yearly. These services include 70 hospitals with a total of 804 beds, 114 home care services, 151 share-care services, and 289 community care services. The percentage of terminally-ill patients with cancer who receive palliative care has also increased from 29.9% in 2011 to 58.7% in 2016. Challenge Long-Term Care 2.0 Policy includes a very wide range of services, some are provided by NPOs like respite services, community care centers, day care/home care centers, transportation services, and meal services; and some are provided by healthcare systems like chronic diseases management, home care/rehabilitation, LTC facilities and discharge planning. The big challenge that lies ahead is how to integrate services prodded by NPOs and healthcare systems. The Ministry of Health and Welfare has specifically established the Department of Long-Term Care to focus on this challenge. Worldwide, Japan, Italy, Germany and Finland have all become super-aged societies, and the transition periods for each were 11, 19, 36 and 21 years, respectively. With similar cultural backgrounds, Japanâ&#x20AC;&#x2122;s experience in policy-making, system buildup, and resource integration are worthy of reference for Taiwan. In conclusion, as Taiwan is now heading into the second decade of long-term care development, the current system still needs to be reviewed to ensure the system can face the challenge of the aging population and the limited workforce resources. From a policy making perspective, how to connect the two existing systems of health care and long-term care, how to integrate with ongoing various care plans under one scheme, and how to build up the continuity of community care services are the Ministryâ&#x20AC;&#x2122;s current tasks. For people living in rural and remote districts, going to hospitals can be difficult, especially for matters of life and death when the need of palliative care is desperate and the scarce resources make it even worse. Puli Christian Hospital (“PCH”) was established to serve people in remote districts, and it started providing palliative and hospice care services twenty years ago with its palliative team. In 2017, PCH set up its palliative and hospice ward to provide more comprehensive care for Nantou area residents. “When I started to serve in Puli Christian Hospital in 1993, palliative care was an unfamiliar concept not only to the public but also to medic professionals,” recalled Dr. Cheng-Sheng Zhang, who was asked how palliative and hospice care was being set up and promoted. It all begun with a call in 1994, when an old lady with advanced cancer wished to move back to Puli from the United States and die peacefully in her hometown. Her family members inquired Puli Christian Hospital for home care resources, and this call somehow was transferred to Dr. Zhang’s phone extension. At that time, PCH still had insufficient manpower issues and had no precedent of house calls and no idea how to charge for house-call service. Dr. Zhang said to himself that patient’s needs should be prioritized above everything else, and so he drove his car to pay personal visits and provide constant care until she passed away. 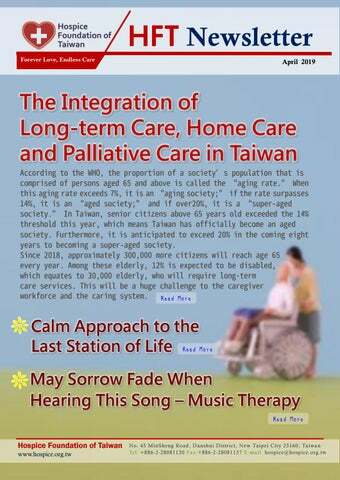 That happened to be the time when Hospice Foundation of Taiwan (“HFT”) started promoting palliative care and providing classes for professionals. 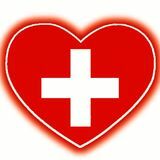 It was not until Dr. Zhang read about HFT that he understood what he did for the old lady was called palliative care. He registered for HFT’s training class and was determined to provide more palliative services to people who need it. It was not long after that the government started to promote the palliative care pilot project. HFT also sent a team to visit PCH and encouraged it to set up a palliative team and provide palliative care to the neighboring area. In 1995, PCH appointed Dr. Zhang as the physician to lead its palliative team to start providing home care services. With insufficient manpower, PCH insists on serving people and providing palliative care service. The covered areas expand from Puli to remote districts like Guoxing, Yuchi, Shuili, Xinyi, Rea’ia and more. PCH is the first to start providing palliative care in the Nantou area, and has been doing so for more than 20 years. “Though the shortage of manpower hasn’t been solved, our nursing staff pays home visits constantly, and has exceedingly surpassed the NHI cap of 45 visits per month. As long as patients need us, we shall continue to visit them,” said Dr. Zhang with affirmation. candidates are rare and unable to meet the nurse/bed ratio of 1:1; thus the number of beds has reduced to 5 beds,” said Bao-chu Lai, the Nursing Supervisor of PCH. Once PCH recruits enough nursing staff, the ultimate goal is still to offer 12 beds. Once Stabilized, Patients Return Home While most people assume that the palliative and hospice ward is a place of no return, more than half of the patients who check in at PCH actually return home once they are stabilized. “This is one of the purposes of patients to choose to stay in the hospice ward. When patients check in, we ease their acute symptoms and refer them to the home care team to take over once they are stabilized,” said Nursing Supervisor Lai. Dr. Zhang added, “What we hope to provide is comfort. When we go to the communities to promote palliative care, we always explain palliative care to the public in a very direct manner. We tell them palliative care does not mean giving up, but means to ease your pain and symptoms, and maybe even to help you live longer.” For most patients living in the cities, once they check in to the hospice ward, they would prefer to approach their end in the hospitals. However, for people living in rural districts, they prefer to revert to their origins and go back to their familiar houses, with their family members and in their neighborhood. This is why the palliative team of PCH will endeavor to support patients’ condition in the shortest time possible to reduce hospitalized time. Patients’ family members will also be taught how to care for advanced patients, especially what should be expected and cared for at the end of life stage, so that both can feel ready and focus on that moment rather than panicking. comfortable at expressing their feelings. We help them focus more on how much they are being loved and to love themselves. They are not burdens just because they are sick, but they are loved dearly. This helps patients feel calm and fulfilled. Additionally, family members who care for patients have also a share in the distress and pressure. As a result, the palliative team not only cares for the patients but also for their family members. Director Yang also shared a case story with us. When Director Yang was communicating with an old lady who suffered from liver and renal dysfunction, he discovered this old lady had been referred from many hospitals and hadn’t been home for quite some time. Though her husband accompanied her to the hospice ward, deep down in his mind, he was still looking for other medical services to revive her. The lady showed distress and was not willing to cooperate. Noticing her discomfort, the PCH palliative team members started to communicate with her husband for her longing to go home. Finally, the husband agreed to take her home. Later Yang heard from the family that once the old lady returned home, she felt safe and relaxed, and enjoyed a long sleep. A few days later, she passed away peacefully. PCH palliative team’s heartfelt care has touched many hearts. “Many things we use to care for patients have been donated by patients’ families, such as the essential oils for patients’ massages, the piano played for them, and the car driven on visits. Some family members have even signed up for volunteering,” said Nursing Supervisor Lai. These stories of helping patients’ lives have all become the driving force and motivation to the hearts of the PCH palliative team members, who are encouraged to continue serving fervently. playing a game, but in fact, this is rehabilitation designed to be fun in order to motivate children. Instruments are also situated in the corners of the room, and once children make it to that corner, they are allowed to play the instruments as they like. “This child improved from 2-3 steps at a time to 3-4 steps, and it took 10 classes for him to finish all the footprint marks in a single attempt.” Liu believes in the value and results that music therapy can bring to children with severe diseases by personally witnessing the improvements of many such children; as a result, her heart is filled with a sense of mission and accomplishment. With all the times she has spent with her young patients, her career path also emerged. “Compared to those who wish to learn an instrument professionally, I am led to believe that these patients with severe diseases need me more,” Liu said.